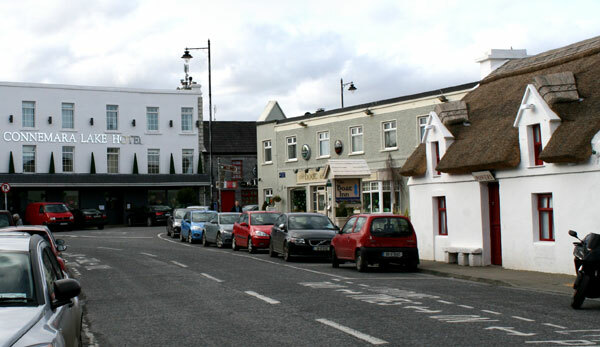 Oughterard is a lovely country village on the shores of Lough Corrib, the largest lake in the republic. The lake provides stunning views and historical sites as well as many outdoor activities such as fishing, boating and a lake cruise. There are also many horse riding stables, hill walking and hiking trails, outdoor sports and scenic drives to be enjoyed and loads of attractions near Oughterard to keep you busy for weeks! Oughterard is at the Gateway to Connemara, a well-known mountainous lake area of exceptional beauty and steeped in tradition and history. Many days could be spent exploring the many small roads, hidden lakes and coastal drives that this area holds. Irish Traditional music, Connemara Ponies and turf fields are just a few of the unique features that may be experienced and learned about. From historical sights, to mountain biking trails and world-class fishing & golfing, there is something for everyone! Walking & Hiking Trails – There are endless walking and hiking trails around Oughterard & Connemara, as well as the famous Western Way. Here is a list of walks all around Galway County. We here in Carrowntober house organise walking trips, for groups of five or more, around the local Owenriff River and around the beautiful woodland walks throughout the local area. We can also cater for walks further afield which would mainly be along the route of the famous Western Way walking trail. We will arrange transport to and from entry / exit points along the route and make sure you are back in time for a hot meal in our guesthouse before you retire to a comfortable bed. If you would prefer to sample some of what our charming village has to offer before you retire for the night, we would be able to provide transport to and from the village. Oughterard Golf Club – Have a world-class round of golf at this 18 hole parkland course. Relax in the clubhouse and enjoy the restaurant, bar and pro shop. Corrib Cruises – Why not take a cruise on Lough Corrib, over to Ashford Castle and explore the monastic ruins on Inchagoill Island? Derroura Mountain Bike Trail – Located just 7km west of Oughterard on the N59, you will experience breathtaking views of Maam Valley, the Twelve Pins and Lough Corrib on this 16km biking network. Aughnanure Castle – A well-preserved Irish Tower House, built in 1500 by the O’Flahertys. Guided tours available seasonally. Find further information on attractions in Connemara and attractions in Galway City.